The origins of bratwurst lie firmly in the German region of Bavaria yet it has become a staple of the American sports scene being served at sports arenas all over the country. Indeed in some stadia the sales of bratwurst exceed those of the hot dog. I'm having a beer with my Bratwurst sausage! Both of the above seem quite plausible but I've seen it written that Bratwurst actually means "farmers sausage", the German for farmer is "landwirt" so I think that this explanation is wide of the mark. 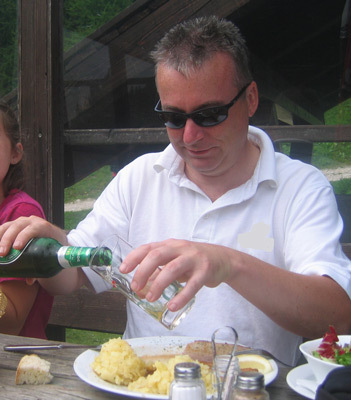 In more recent history the "Brat" traveled to Milwaukee Wisconsin USA with German and Polish immigrants where it has been firmly adopted as Wisconsin sausage. Both sausages are made with a meat content of pork and veal (sometimes chicken) although the mix ratio is different with bratwurst having a higher veal content. To learn more on the difference click here. If you choose to use chicken rather than veal in your meat mix then use the thigh meat. You will need to prepare approximately 2m (7 feet) of small diameter hog casing. Read my section on making homemade sausage to see how this is done. Dice up the meat into cubes and grind using an 5mm plate, place the ground meat in a mixing bowl and return to the refrigerator. Mix the seasoning ingredients together to make a paste and place this in the refrigerator for 30 minutes. When everything is well chilled, mix the ground meat and seasoning together and knead the mix for a good 5 minutes to ensure that the seasoning is well dispersed. A gloopy mix is a sign that you've got a good emulsion and this will ensure a moist sausage. Pack the sausage meat into your stuffer barrel, fill your hog casings and make 6" links (approx). When finished, place your homemade bratwurst sausage in the refrigerator on a bed of paper towel and allow the seasonings to be fully absorbed by the meat overnight. See below for cooking and serving suggestions. 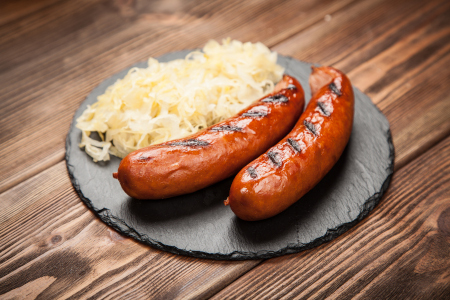 Despite the fact that most bratwurst are served fresh, there are still some very good smoked varieties on the market and in order to smoke sausage you need to ensure that it is first cured. My cured homemade bratwurst sausage is pretty similar to the recipe above with addition of Prague Powder #1 and I've used marjoram instead of nutmeg which adds a slightly more Mediterranean flavour. You will need to prepare approximately 2m (7 feet) of small diameter hog casing. Pack the sausage meat into your stuffer barrel, full your hog casings and make 6" links (approx). When finished, place your sausages in the refrigerator on a bed of paper towel and allow the seasonings to be fully absorbed by the meat overnight. If cold smoking then now is the time to undertake this part of the process. For fresh bratwurst the traditional method is to grill the sausage until the internal temperature reached 71°C (160°F) and then allow them to rest for 5 minutes before tucking in. Alternatively they can be poached prior to grilling, a favourite method for cooking bratwurst in America. Moreover the Wisconsin sausage differentiates itself by being poached in beer prior to grilling. When it comes to the cured Bratwurst then if you haven't already cold smoked it then try hot smoking, it's a longer process but produces a nice result and eat it cold. Serve either homemade bratwurst sausage in a bread laced with horseradish, mild mustard, chopped onions and slices of dill pickle.